Heartbreaking Cards of Staggering Genius: Is It Real? A few weeks before Bob Feller died I bought this autographed Baseball Legends card for $2.00...There was no COA and it's not an official signed older card as you sometimes see in the Topps Heritage sets. So, if real, the card was either a through the mail request or maybe signed in person. But "is it real?" is the important question. I have an official Bob Feller autograph that I purchased from the Bob Feller museum in Van Meter, IA last year. Here's what that signature looks like and compare it to the on-card autograph. It is the "B" in "Bob" that is getting me here. The "F" in Feller looks okay to me. Here are a few other certified versions of Feller's signature for you to compare. It seems to me that on my Baseball Legends card he was signing with a pen with a wider tip and that's why it seems like the Baseball Legends signature is not as precise as the others. What do you think? Fake or genuine? Labels: bob feller, is it real? I'd be 95% comfortable that it's real but I'm no handwriting expert. Such concerns are why I can't get behind the autograph thing too much without a certification or unless I personally got the autograph, of course. But I'm suspicious by nature. Picked up a slew of autographs at The National, including a couple from the same guys. Signatures from a couple of them that signed balls appear to be quite different than the on-cards from the same player - signed in front of me seconds apart. I just don't know how even the experts can be sure. I'd say real. Also, Feller was a very active signer so there really isn't much money in his autos since there are literally thousands of them... thousands upon thousands. He is probably the most affordable top level pitching Hall of Famer available- right next to Spahn. I'm going to be the naysayer and say fake. Feller signed a TON so it is very possible that it is real, but comparing autographs I'm less worried about the "B" (which just looks a bit sloppy) and more about the F. Notice how the F connects into the lower case E on yours, but in all of the certified ones the F has its own defined start and finish point, while the "e" then starts on its own. I think it's real. With the amount of autographs he did, I don't think a sloppy B is too big of a deal. I'd venture and say it was TTM. If someone was faking it, I doubt they would put the signature vertical anyways. 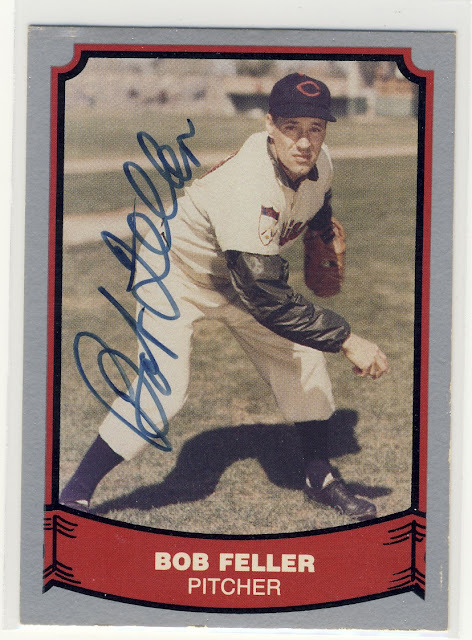 As others have said, there's no real percentage in faking a Bob Feller autograph - he must have signed a million over the past few decades. Bob Feller signs all day every day. There is no future in faking his autograph. You may as well start counterfeiting pennies.